On November 19, 2013, Noisy Planet, a health education program developed by the National Institute on Deafness and Other Communication Disorders (NIDCD), part of the National Institutes of Health (NIH), held a TwitterChat on noise-induced hearing loss. The National Institute for Occupational Safety and Health (NIOSH), part of the Centers for Disease Control and Prevention (CDC), joined the chat as co-host. The TwitterChat was held as part of the NIDCD’s 25th anniversary celebration and the fifth anniversary celebration of Noisy Planet. Sound and noise surrounds us in our daily lives—whether from TV, personal music players, household appliances, sporting events, or traffic. Sounds at safe levels do not damage our hearing, however, harmful noise; sounds that are too loud or loud sounds that last a long time, can damage sensitive structures in the inner ear, causing noise-induced hearing loss. Our TwitterChat helped participants to learn more about noise-induced hearing loss and how to reduce the risk of noise-induced hearing loss for themselves and their families, co-workers, and community. We were joined by noise-induced hearing loss experts Gordon Hughes, M.D., of the NIDCD, and Rick Davis, Ph.D., of NIOSH. Dr. Hughes is an otolaryngologist—head and neck surgeon—who oversees NIDCD-sponsored clinical trials conducted by scientists around the country. For nearly 30 years, he served on the clinical staff of the Head and Neck Institute at the Cleveland Clinic in Ohio before coming to the NIH. Dr. Davis is a co-team leader of NIOSH’s Hearing Loss Prevention Team. Sounds are all around us—but when they are too loud and too long, they are damaging to our hearing. 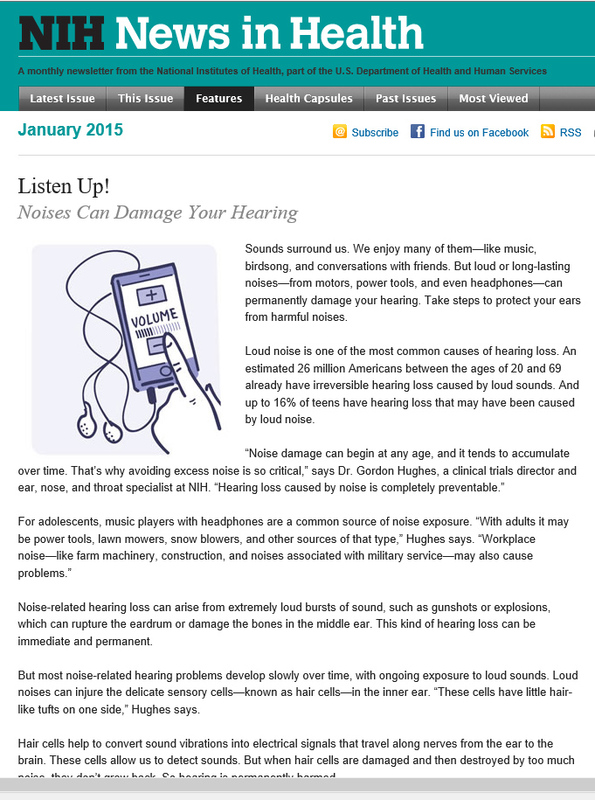 Be sure to check out the January 2015 edition of NIH News in Health that discusses noise-induced hearing loss and how to prevent it. 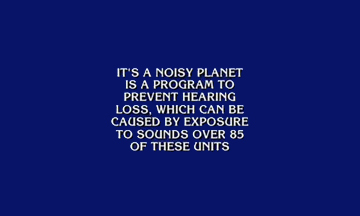 During a Kids Week episode of the TV show Jeopardy, viewers learned about the Noisy Planet campaign and the importance of protecting their hearing.